There is a well – equipped library with an extensive range of reference books, newspapers, magazines, periodicals, educational CD’s, Computer workstations, printer and photocopier. There is a computer aided referencing system, which enables students to rapidly locate books. As part of the focus on E-learning, students are encouraged to use the internet and to access online International libraries for information. The library is unrivaled with more than 10000 books, digital media, latest periodicals and journals. We have links with the British Council library and other major libraries in addition to an easy access facility. An innovative “Library – on – wheels” feature adds imagination to an already stimulating experience. Students are also marked on books presentations. Our endeavour is to inculcate the habit of reading in the growing children so that they learn to go beyond the curriculum. 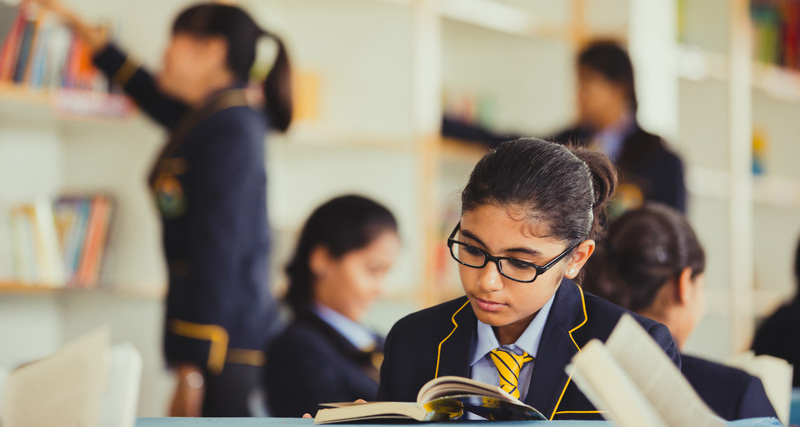 AIS has a well established library which is an integral part of the school. It is managed by a well qualified librarian. It provides a stimulating, user friendly and information rich environment. Its resources also help in integrating it, with our well equipped laboratories and its activities. It has a vast collection of fiction and non-fiction books. It has a wide variety of books on art and craft, travel, drama, poetry, philosophy, competitions. A wide range of encyclopedia and reference books meets the recreational and curriculum needs of students and as well as teachers. We subscribe to a large number of journals and periodicals. Teacher Resource section of the library is regularly upgraded and updated for teachers. It also has a wide range of regularly updated CBSE, IGCSE, ICSE and NCERT publications as well. Library periods are slotted for classes and students are helped in selecting useful books by their teachers and the librarian.